As I continue re-integrating music into my professional life (the upcoming release of my most ambitious album ever is starting to feel more real), there occasionally come unexpected moments of wonder. 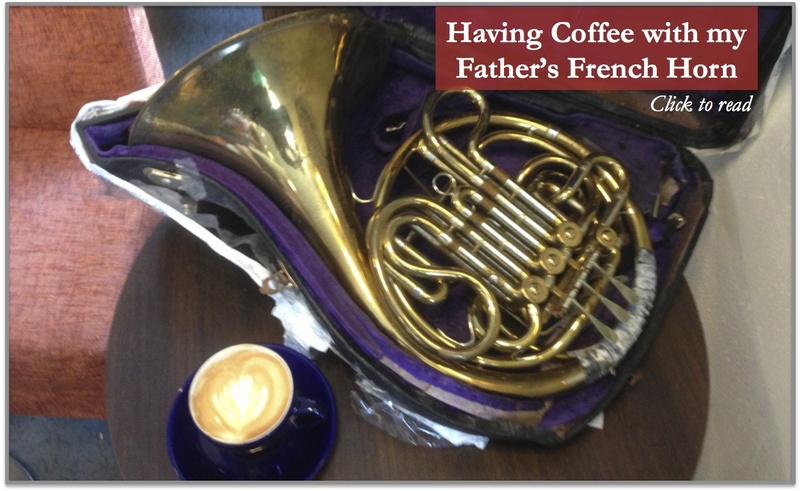 Consider this French horn, which I have brought with me to this cafe. (I’m taking it in for appraisal.) This was my father’s French horn. He died in 1985, but he had stopped playing the instrument a quarter century before that. In fact, he used to half-joke that I was the reason he stopped playing, because I-as-newborn cried when he practiced. The truth of the matter, as I learned later, was that my father — not unlike myself — had left professional music for other intellectual interests (and steadier pay), some years before I was born. My father had authored a successful music textbook, Basic Counterpoint, before he even finished graduate school. But he was restless, Harold AtKisson, and he switched over to writing, teaching English, and being a professional hypnotist in the late 1950s. Long story. If it were not for this French horn, I would not exist. My father’s musical skill (he was something of a prodigy on this horn) helped him run away from an abusive family situation when he was 15 and join the National Guard. The soldiers took him in, sheltered him, and let him lie about his age, partly because they needed a good French horn player for their band. Music was literally my father’s salvation. He stayed, moved to the US Army when he came of age, and this horn ultimately took my father to Hollywood, where — because of his role in an Army band during wartime — he met many of the musical stars of the day (I have his autographed photographs of Tommy Dorsey, Frank Sinatra, Red Skelton …). But he was too smart and restless, even then, just to play his horn. He ended up spending two wartime years in the Aleutian Islands of Alaska, as an Army Intelligence officer. The experience changed him, not for the better, and I wrote a poem about that (another long story). Back from the war, Harold AtKisson pursued a relatively brilliant if erratic musical career, before shocking his professors with the successful textbook, and landing a position at the prestigious Eastman School of Music in Rochester, New York. Where he met my mother. The story of my mother (herself a prodigy on the organ and piano) and father’s meeting and their marriage just three months later is the stuff of legend in my family. It involves private detectives, family shock and dismay, kleptomania, and scenes straight out of the black-and-white movies of the day. I’ll write that story another time. For now, I will just report that I, their first child, was born 2-1/2 years later — thus proving to the tut-tutting relatives that it was not pregnancy, but true love, that had pulled my parents together like an electromagnet. They waited that long to get pregnant on purpose, just to make the point. So there it is. Without you, French horn, and the specific life-path that you made possible for my father, I would not be alive to experience the joy I felt yesterday, sitting on the porch, picking the strings on my guitar, feeling its vibrations float through and around my upper body, and listening to my wife and children chatting in the kitchen. Your life made my life possible, French horn. Thank you. And drink your coffee. We have an appointment to keep. I truly appreciated hearing family history that I did not know … thank you so much for this beautiful piece … and for your restless intellectual exploration.